Last Monday was a bank holiday so, if twice can be called a tradition, in true IpBoG tradition we started at 2pm. I turned up to find Muir trying to teach Matt how to play Netrunner. The corporation attempts to rez their remote servers, protecting them with ICE while the runner upgrades their rig to make a run on the corp's R&D. I don't know what any of this means but I know that is sounds pretty cool if you're a nerd. And I am a nerd. Matt walked away looking confused while Muir had a big grin on his no good, cyberpunk face. I'm pretty sure Muir won. While I was in Berlin last week I picked up a copy of Skull & Roses. But not version with the tattoo style artwork that was fashionable a few years ago, the more recent version with sugar skull artwork that's fashionable now. This version actually goes by the moniker of just Skull but has the exact same rules as it's predecessor. 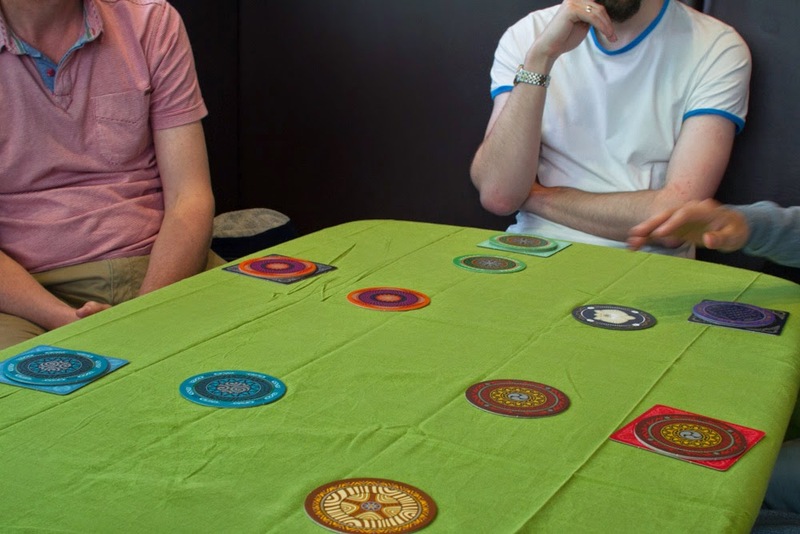 Its a bluffing game that takes about five to ten minutes and basically involves everyone pretending they're thinking about challenging in order to trick the other players into betting on you and losing. Or are they double bluffing? I won one of the games thanks to my excellent triple bluffing skills. Someone else won the other, I think probably Chris. After that we took on Ghost Stories. We were playing it slightly wrong last time, making it a little easier for ourselves, so we wanted to make sure we could still beat it playing correctly. Just over half way through the board was almost completely full with ghosts and it looked like we were going to lose but I took one (or four) for the team, sacrificing four qi tokens to exercise four of the tougher daemons. With the board freed up we lasted to the incarnation of Wu-Feng and took him out in just two turns. Take that, innominate objects! Ghost Stories, the rumours of your difficulty have been greatly exaggerated. Although it probably was one of the easier incarnations. And we were playing on the super easy, introductory level. Next we played Strozzi, a game that a lot of people own because you could pick it up for £4 from The Works a while back, but no one seems to love. And although I own it but don't love it, I do enjoy it. Its a game or risk, reward and horrible artwork. In what is fast becoming another IpBoG tradition, Matt won. A couple more quick games of Skull and then on to something heavier. 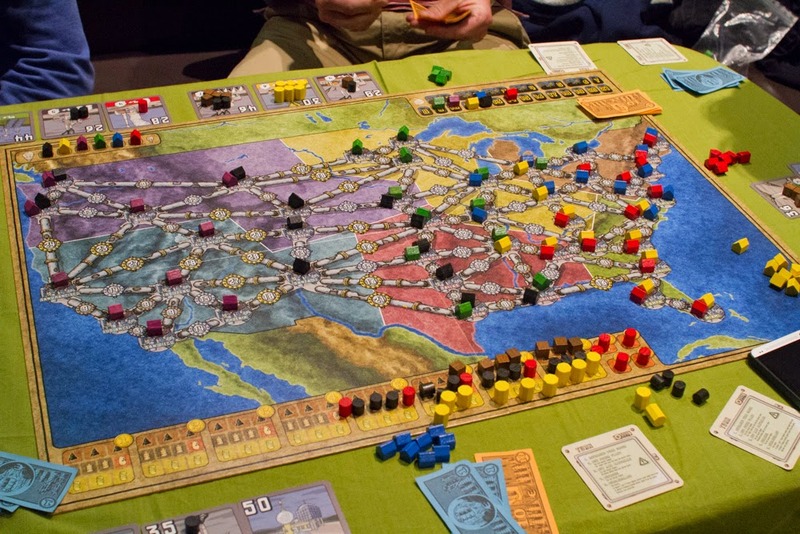 Dan's been bringing the same game in for the last few weeks but it never got to the table, so we put on our Hazmat suits, stoked our furnaces and sat down for a game of Power Grid. Matt, Dan and myself all started on the east cost but the over crowding didn't stop us. Well, it stopped me, Matt and Dan were the only true contenders. Not wanting to break tradition Matt made a valiant effort but Dan used his secret skill of being the only guy to have played the game before and finished way ahead. Back to the usual 7:30 start next week. Oh, and in case you couldn't tell from the pictures, Muir's bought a tablecloth!